Once upon a time, in 1944, two school girls met in fourth grade. It was a time when the one-room schoolhouses that served the children living in the outlying areas became centralized with the schools in the Town of Marion. Hence, the farm children were bused to school. The town children walked to and from school with their neighbors and after-school playmates. As a result, it was not unusual for the “country kids” and the “town kids” to be acquaintances rather than close friends. Little did they know that serendipity would strike them again down the road. Marge Hermenet, a country girl, began her schooling at the new centralized school at the age of 9. There she was introduced to Merle Temple who had been attending the school since 1940 at the age 5. They would go on to graduate from high school being but mere acquaintances. Although they were both on the cheerleading team. Upon graduating from high school, Merle married Conrad Mohr of Newark and the couple moved to Grace Avenue in Newark to what became their family homestead for 61 years raising 2 sons and a daughter. Marge Hermenet, at the age of 19, was betrothed to Francis Dewind of Newark. The couple resided in Marion for the next 35 years raising 2 sons and a daughter. Francis Dewind’s parents, who had resided in the outskirts of Newark, purchased a home in town. Ironically, becoming next door neighbors to Merle Temple Mohr and her husband, Conrad. Marge and Frances’ children frequented their grandparents’ home in Newark regularly playing with Merle and Conrad’s children. While Marge and Merle always exchanged waves, quick hellos and brief conversations around the kids, they remained but mere acquaintances. Life went on for Merle and Marge, both staying home to raise their children and then returning to work once the kids were older: Merle worked at the Newark Telephone Company and eventually for her husband’s greenhouse business while Marge worked for Lincoln Rochester and later for First National Bank of Marion. 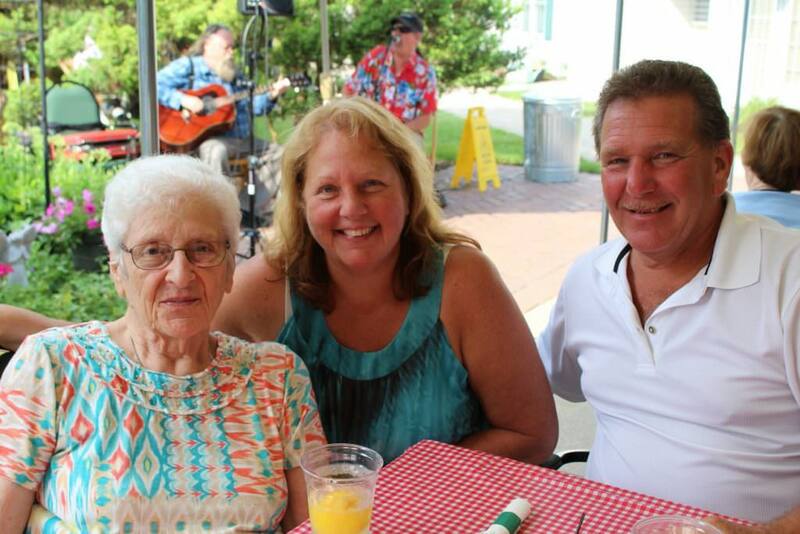 Marge Dewind (left) with her daughter and son-in-law. Fast forward 35 years: Marge and Francis DeWind sold their home in Marion, wintered at their home in Bradenton, Florida and summered at their home in Friendly Village in Manchester, NY. Unfortunately, Marge found herself suddenly widowed when Francis unexpectedly died of a heart attack in September of 2010. Missing Francis, but determined to keep on going, Marge continued to go to Bradenton every winter for three years until 2016 when she made Friendly Village her year-round home. Meanwhile, Merle and Conrad stayed on at the family homestead enjoying traveling together and sunning poolside in their backyard. Eventually, Conrad’s health began to deteriorate leading to 12 years of being wheelchair dependent. Merle took on the challenge of being a caregiver, but was diagnosed with Parkinson’s Disease; she found herself more and more housebound for the 5 years leading up to Conrad’s passing on Father’s Day of 2016. After his passing, she continued to live in their home on Grace Avenue. 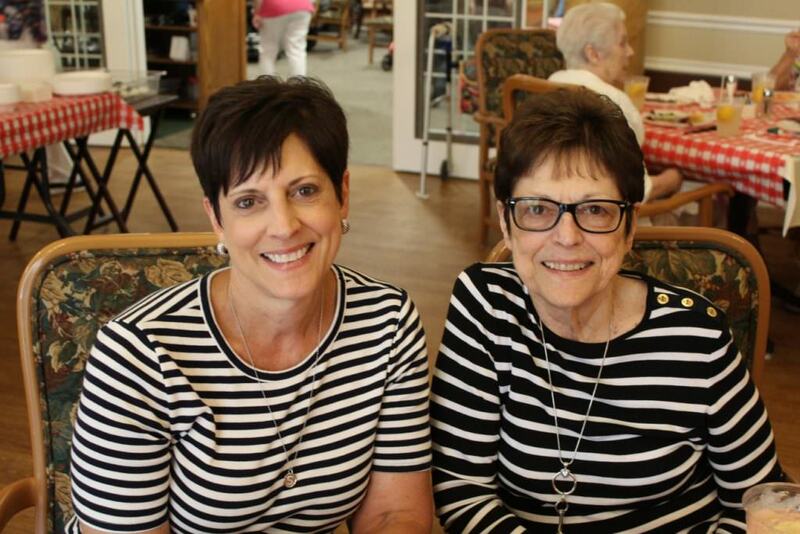 Positive attitudes, a love for learning new things, meeting new people and overcoming diversity were hallmarks of both Marge and Merle’s lives. Both sound of mind and fiercely determined to maintain their independence they were about to make a life-changing decision. Stay tuned for Serendipity Strikes: Part II of Merle and Marge’s Journey!